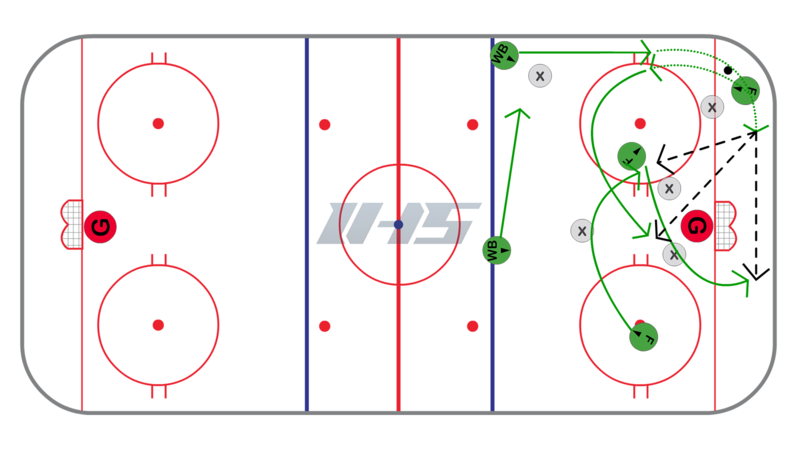 Offensive Zone - Middle Exchange Options | Ice Hockey Systems Inc. This option could also be combined with the wall exchange options. It starts the same way with a switch as the offensive defender comes down the wall to do a switch with the puck carrier. This time the player in the slot will exchange positions with the net front player. Doing the switch in the slot will create confusion for the opponents. As the offensive defender carries the puck low behind the goal line they will look into the slot. The first look should be the strong side player that has just exchanged positions from the front of the net. Other options are to look back door to the other forward that has just moved from the high slot. They can also carry the puck around the net and continue to look for players that are finding space higher in the zone.